I recently dove into the world of jewelry making and its so much fun! Ceramic beads are so easy to make and the possibilities are endless. I had to do a little bit of research about how to attach the clasps etc. but Youtube has lots of helpful videos. Its amazing how much you can learn on the internet. I started with a few simple earring designs using some leaves from the yard for inspiration. Initially, I added little loops of high fire wire in the tops of the beads while the clay was still soft for attaching the earrings hooks. Some of my beads were coming out great, but lots of them were cracking and breaking during the drying process because of the high fire wire. As the water evaporates from the clay, the particles move closer together causing the clay to shrink around the wire causing cracks. So I ditched the wire and started putting holes in the beads instead. This works great as long as the clay is thick enough and soft enough and you're careful not to fill up the hole with glaze when painting it. I also found that copper earring hooks and copper wire add to the natural earth tones of my beads rather than the stainless steel hooks. Some people can't wear copper, however, so I need to develop a design that goes with the stainless steel hooks also. 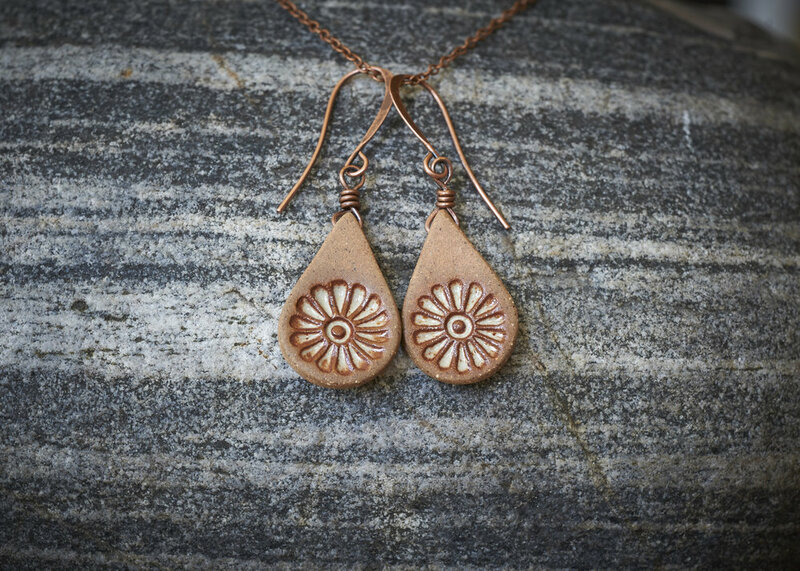 I made some matching earring and necklace sets using various cookie cutters and my Korean master potters' flower stamp. After firing them I attached copper hooks and 3mm copper chain. some more angular. One of my favorites turned out to have a combination of both curves and sharp angles, reminiscent of a Native American arrow head. I love the combination of the earthy tones and the natural leather and native theme. Along the same theme I added a copper feather charm to this circular pendant which draws on a dream catcher design. The ceramic pendant is dipped in a goldish glaze giving it a modern look while the leather strap and feather charm maintain an natural feel. I'm still experimenting with shapes and designs and colors. I'm also really looking forward to testing out some textures. The possibilities are endless even with just a few different circular and triangular cookie cutters! I love making these pieces and I'm really excited to continue developing more designs.